to his faithful people and to those who turn their hearts to him. This psalm is a prayer for restoration because the Lord has forgiven the iniquity of his people and blotted out all their sins. Even more, it is a psalm of hope because in Jesus Christ, God has acted to grant mercy and salvation! Through Christ, God has spoken peace to those who turn their hearts to him — so that salvation is near to those who fear him. As the people pray for forgiveness and restoration, God makes reconciliation a reality through the gift of his incarnate Son, crucified and risen! It might be a good thing for us to pray during Advent for restoration of homes, congregations and nations. It might be a good thing that we pray that all in our world would listen to what the Lord God is saying, as he is speaking peace to his faithful people and to those who turn their hearts to him. It is God’s will that his glory dwell in every land, which is why he has made salvation near, in Jesus. In these dark days of December, it may seem that restoration, peace and hope are far off. It is common to hear folks complain today about things being worse than ever before. Certainly, we have not known the persecution of Christians in our lives to match what has been happening these last few years. Tension between political parties, the drug abuse crisis, difficulties between nations and peoples all lead to what might be a hopeless world-view. But that is not the perspective of we who have hope in Christ! In him, mercy and truth have met together! In him, righteousness and peace have united! 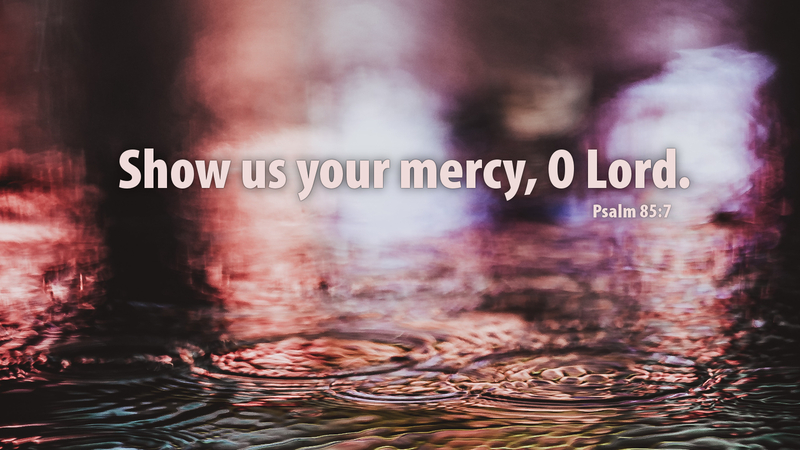 God has shown us mercy and granted us salvation in Jesus Christ! Let us share that good news, as we proclaim light in the darkness! Prayer: Lord God, through the good news of Jesus Christ your Son, turn every heart to you and restore every home, family, congregation and land! Amen. Advent Action: Today, pray for a person or family in need of restoration in Jesus. WOW, just looking at how far away we have separated ourselves as a nation from God in my 68 years on this earth if mind boggling. Christians never believed that prayer would be taken out of our schools, no one ever stood up and fought it and in 1964 it was summarily taken out, a few rogue teachers did continue to allow prayer to exist in some of our classrooms. Dr, James Dobson points to that date as the starting date for our decline as a society. May our voices never be silenced, may the church continue to take a stand for Christ in this world we live in.